Oscars 2018: What's Behind The Ratings Slump For This Year's Academy Awards? While the Academy Awards remain the biggest and most prestigious event in Hollywood, the Oscars are fighting a losing battle in popularity with US television audiences. Since a peak of 43.7mil viewers in 2014, the live broadcast of the ceremony has been experiencing a decline in US viewers with this year’s drop-off being particularly pronounced. ABC Network’s broadcast of this year’s Oscars was watched by 26.5mil US viewers according to Nielsen: a 19% decline from last year’s ratings of 32.9mil. This marks the sharpest drop in audience share – at least for broadcast television – for the Oscars this century. The reasons offered for the diminishing viewership have been multiple with the main “nominees” being: the selection of niche films nominated, changing viewer habits, and the Oscars prominent political stance. So, is there only one name in the envelope or is it a combination of these factors which has led to this decline in the Oscars’ audience? Oscar Keeps Its Indie Cred, But At What Cost? Last year, after the shock Best Picture win for “Moonlight”, we detailed how the Academy’s championing of more niche films proved to be something of a leveller for indie films to compete with blockbusters in terms of attention share. This year, the Academy remained the vanguard for more niche films granting low box office performers such as “Call Me By Your Name” and “Phantom Thread” multiple nominations. A common theory goes that the Academy’s insistence on focusing on these highly acclaimed but less widely watched films is causing apathy among viewers who may be less likely to engage with a ceremony that mostly recognises titles they probably have not seen themselves. But is there really any correlation between the popularity of the nominees and that of the ceremony itself? As we can see above, the correlation between Best Picture nominees popularity and the Oscars television ratings are few and far between. Certainly, when we consider that the sharpest drop in the average box office gross occurred between 2011 and 2012 saw a 4% increase in the Oscars ratings between the same years, it is difficult to establish the popularity of the nominees as having much of, if any, effect on the ceremony’s viewership. That this year saw an increase in the nominees average gross, led by the box office hits “Get Out” and “Dunkirk”, and such a notable slump in the television audience further suggests that viewers are not concerned about the popularity of the nominees. The Academy Awards is not the only key televised event this year to experience a decline in viewers with both Super Bowl LII and the Grammys 2018 receiving lower ratings than last year. In light of this, the constantly shifting viewing habits of modern audiences have to be taken into consideration. The phenomenon of cord-cutting is well-documented and it is one which is on the rise among the Oscars’ key audience: movie fans. According to GWI data, the amount of US movie fans who “Do not watch TV” has nearly doubled during the Oscars’ ratings decline since its peak audience in 2014. Nielsen’s ratings of this year’s ceremony do not take into account viewers who would have streamed the event via ABC’s service. That US movie fans are predominantly in the 16-25 year old demographic could mean that the rumours of the Oscars’ demise among audiences are greatly exaggerated since this core audience is migrating to digital means to watch it - such as in the form of mobile video clips - and will likely continue to do so in the future. 2018’s Oscars ratings slump has been seized upon by the American right as an indication that the increasingly liberal nature and platitudes of the Academy Awards are beginning to alienate mainstream American audiences. Looking at the response to last year’s ceremony in regards to the political sentiment surrounding it, they may have a point. With the sentiment being overwhelmingly negative compared to the positive, it is reasonable to suggest that the Academy Awards’ political stance is not only polarising but detrimental to its appeal. Inevitably, this political backlash has been led by one man. To see the hashtags #Trump and #TrumpTrain leading the charge of prominent calls to #BoycottOSCARS should not be a surprise to anyone after the president blamed last year’s Best Picture fiasco on the Academy being “too focused on politics” - politics that both he and many of his supporters are not sympathetic to. Since this year’s ceremony was dominated by the #MeToo and #TimesUp campaign, the call to boycott the Oscars would have likely been heeded by Trump supporters who would have anticipated the inherently liberal calls to action caused by the aforementioned movements. 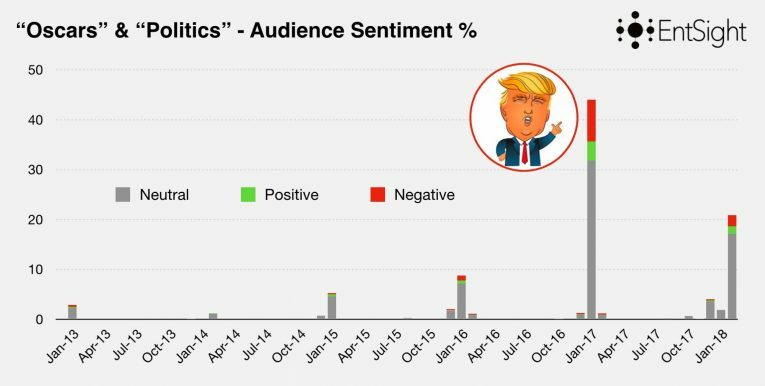 Likewise, Jimmy Kimmel – who has been particularly vocal in his criticism of Donald Trump on his talk show - hosting the ceremony for the second year in a row would have also been a turn-off for Trump supporters as is evident by his name appearing above in relation to the Oscars’ politics. 2014’s peak ratings coincided with the famous Ellen DeGeneres’ selfie “breaking Twitter” demonstrates Oscars’ reliance on social media to drive engagement with the ceremony itself. 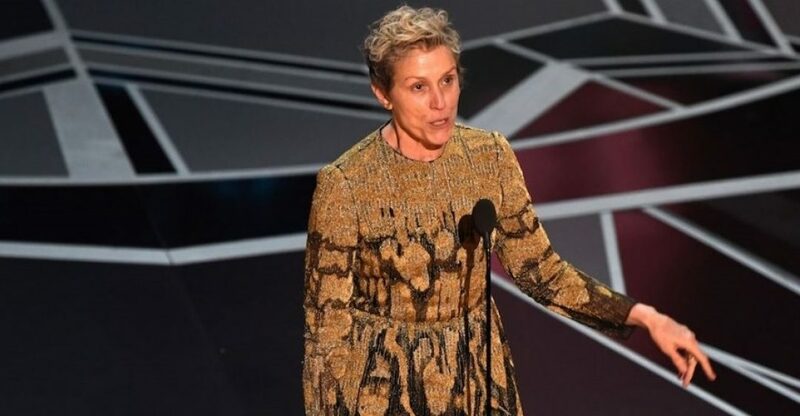 So the likelihood of the Oscars toning down its politics is remote after this year’s Best Actress winner Francis McDormand’s rousing “inclusion rider” acceptance speech became one of the main talking points on social media. With the hashtag #InclusionRider top trending on Twitter soon after the event, it is likely that Trump supporters will continue to view the Academy Awards as a bastion of liberalism adverse to their political leanings. As such, this polarising political schism with US mainstream audiences is one that the Oscars is unlikely to repair, even if the Academy is inclined to do so. But there are strong signs that it is contributing to their increasingly diminishing audience.